My brother played baseball. He’d had his nose broken. Arms fractured. Skin ripped open by sliding metal cleats. His brown hair was always buzzed short to the scalp during the summer. His shoulders were broad and his arms were strong. When he came home from a game or practice he’d peel off the sweaty layers. 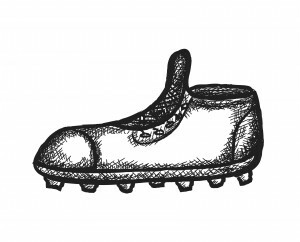 Each cleat popped off his foot left clouds of dust in the air. Bits of hard clay and dirt on the kitchen tile. Thick, high socks left those ridges in the skin on his shins. Back of his neck tanned shade of brown my skin will never be. Dad had always coached a team. It didn’t matter whether it was my brother’s, but he’d always been very involved in our town’s league. Mom pretended to know exactly what was going on in every game on television or at the field. We were a baseball family, as I imagine many families to be. All the talk about the game didn’t end at the park. It traveled home in our cars. Made its way into our living room. Sat next to me at the dinner table. His elite team won the district tournament when my brother was in the summer between his junior and senior years of high school. Won the state tournament too. And made it to the final day of the New England Regionals. He was at that age where he began thinking seriously about college. Maybe he knew that he might not get the chance to play baseball anymore after high school. I watched him as he suited up that last time. Flame in his eyes. That was what I remembered of him. I sometimes remember the blur of my parents. My brother laying in the dirt. Someone grabbing my arm from behind pulling me away from the fence. Ohmygods. A coach from the other team calling 9-1-1. I remember not being able to breathe. The haunt of ambulances and people sitting silent. My mother screaming screaming screaming. It was a sort of freak accident—baseball to the chest that stopped his heart. I’d spend my whole life missing him. Bickering and the arguments. Walks to the corner store for candy and slushies. Bike-riding to the dead end and back up to the stop sign. I missed the summer I wanted to collect baseball cards so he wouldn’t have something that I didn’t. I kept the dozen cards my dad bought me in an old cookie tin. RBI, ERA, IP: Codes I couldn’t decipher. I longed the summer before it happened. When his team made it to the final game of a tournament. I wore one of his old jerseys that didn’t fit him anymore. Our last name stitched on long ago by our mother, letter by letter. When they lost and he saw the jersey after the game. Told me I was an idiot for wearing it. When he and his teammates went to Hooters after and he wasn’t nine anymore. Everything that happened after that was regarded in “he-would-be’s.” He would be graduating this year. He would be going to college this month. He would be eighteen today. Extra stacks of prayer cards sat in a plastic grocery bag on a chair in the dining room. His name at the top, laminated. Should we tuck them into binders with those plastic sleeves like he used to with his baseball cards? The ones of Nomar Garciaparra with his bat cocked. Of Jason Varitek crouched behind the plate. Gloved hand extended. When we went on family vacation every July by the lake, we stayed in a small cabin with wood paneled ceilings. At night, from twin beds on opposite sides of the room, we would quiz each other. Used moonlight sneaking through the blinds to find an owl’s face. A skull. A sailing ship. Four panels up from the door. Two feet to the left of the holes left from an overhead light since removed. Our navigation. We laughed so hard our parents knocked on the wall from their bedroom. We lowered our voices. Quiet, so quiet, until one of us stopped responding. Danielle Susi is the author of the chapbook The Month in Which We Are Born (dancing girl press, 2015). Her writing has appeared or is forthcoming in Knee-Jerk Magazine, Hobart, and The Rumpus, among many others. Recently, Newcity named her among the Top 5 Emerging Chicago Poets. Find her online at daniellesusi.com.